The rulers of Disney are no doubt thrilled with the unprecedented success of installment No. 2 in the Pirates of the Caribbean series—after pulling in the biggest weekend in box-office history this month, the movie is already the champion blockbuster of the year. Even more remarkable is the associated phenomenon that seems to occur maybe once or twice in a generation: mainstream recognition (and appreciation) of genuine genius. But generally speaking, it seems most who are deserving of this title are only anointed by a relatively small, enlightened portion of the population, and even then only after suffering years of obscurity and hardship. What Johnny Depp has done here is inspiring—instead of sacrificing himself on the public altar to win over the masses, he has brought the masses to him. He created something so original and with such panache that the entire world not only has to pay attention to it, they can’t get enough of it. By now the media has left little doubt Depp’s inventive portrayal of Capt. 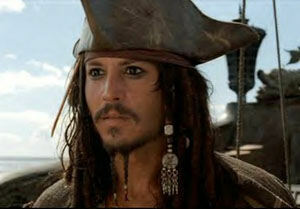 Jack Sparrow is the primary reason for the success of the Pirates films. I’m sure the casting of an exquisite Keira Knightley didn’t hurt, and there are other memorable performances as well, but Johnny’s the one with whom we want to share the ride. He famously based his interpretation of Sparrow as a cross between rock legend Keith Richards and cartoon idol Pepe Le Pew and came up with a character more appealing than any other actor around could have invented. In fact, Depp’s achievement may simply seem remarkable because there’s such a shortage of inventive, daring and charismatic movie stars these days. Guys like Tom Hanks and Tom Cruise will be remembered as the box-office kings of their era, but 30 years from now will people look back and say, “Wow, could those guys ACT?” I happen to like Hanks—he seems like a very sweet guy and a solid actor. But I don’t know if I’ve ever seen that spark of genius leap from the screen during his movies, with the possible exception of Big. Even then, I have to think part of his appeal in that role was the wide-eyed innocence he carried back then. 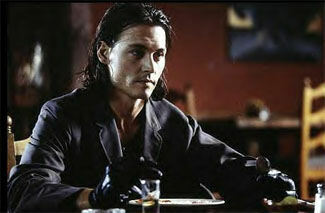 The genius of Johnny Depp is that when you’re watching him on the screen you don’t know what he’s going to do next. It might be a roguish smile at an unexpected moment, it may be an inflection of speech that catches you off guard. He has a comic flair that invites you to root for him even when his character is decidedly unheroic. He brings to his characters a humanity that convinces audiences they are watching a true-to-life, quirks-and-all character, and not a performer playing a role. By now, having recently graced the covers of Newsweek and Rolling Stone magazines, having delivered a movie that will generate zillions of dollars, Johnny’s Jack Sparrow (CAPTAIN Jack Sparrow) has already been over-scrutinized. Everyone by now has heard how Disney executives panicked when they saw the direction Johnny was taking his character. (“Is he supposed to be gay?” they asked. “Is he drunk?”) And volumes have already been written about his starring “outsider” roles in movies like Edward Scissorhands and Ed Wood. But perhaps a more telling illustration lies in a film in which Depp is not even the main character. 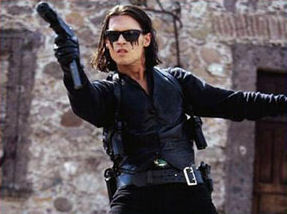 Depp had a hell of a year in 2003—not only did he introduce Sparrow in the first Pirates movie, he also appeared in Robert Rodriguez’ Once Upon a Time in Mexico as the darkly hilarious but sociopathic CIA agent Sands. I suppose in the world of theater you’re not SUPPOSED to take the spotlight from the main characters, but in this instance Depp was, again, the most fascinating thing in the movie. The film is the final chapter in Rodriguez’ Mariachi trilogy, but Depp gave it the extra juice it needed. In one scene his character (an undercover CIA agent who wears a T-shirt with the letters CIA printed on the front—for Cleavage Inspection Agency) tells Banderas the slow-roasted pork he has just eaten is so good he has to kill the cook, in order to restore balance to the country. He then walks into the kitchen and does just that. And still you love the guy. And you’re still loving the guy. He manipulates other characters in the movie, playing one side against the other; plots the overthrow of a legitimate Mexican government, and tries to persuade a young boy selling bubble gum from his bicycle to shoot someone in the head. But he does it all with such devilish joy on his angelic face that when horrible things ultimately happen to him you’re rooting for the guy to come out on top. In a barroom one night I went on a tirade about our current lack of Marlon Brandos, the actor I most associate with the “genius” tag. A friend challenged me, asked what was so special about Brando, and I had my answer ready. Brando saw a moment and instinctively seized it. Whether it’s true or not doesn’t really matter—the scene LOOKS unscripted and spontaneous, and therefore real. That’s the mark of a genius; someone who can see something small and brilliant, something no one else can see, and turn it into something special. It’s fitting that Brando—who co-starred with Depp in the 1995 romantic comedy Don Juan DeMarco—was a friend and mentor to the younger man before his death, because Depp appears to be a similar one-of-a-kind talent. And when so many people at one time recognize an artistic achievement on such a grand scale, well, that’s a cause for celebration. If only it would happen more often.